This grilled pineapple with caramel toffee crunch ice cream is the perfect simple summer dessert. Everyone loves it, you can make it in about 10 minutes, and it cooks on the grill so you don’t have to heat up the house! The last thing you want to do in the summer is bake a cake, am I right? Okay, if we’re being honest, I don’t particularly care for baking cake any time of the year. 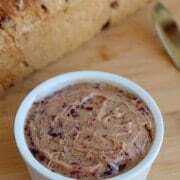 However, in the summer especially, I’m always looking for quick and easy desserts that won’t heat up my kitchen and won’t take long to make. This one is absolutely perfect for a night when you already have the grill fired up for a BBQ, you’ll have it ready to go for dessert too! It all starts with a sweet, ripe, bright yellow pineapple. When I was developing this recipe, I considered adding some sugar to the pineapple, but truthfully, it’s not necessary. 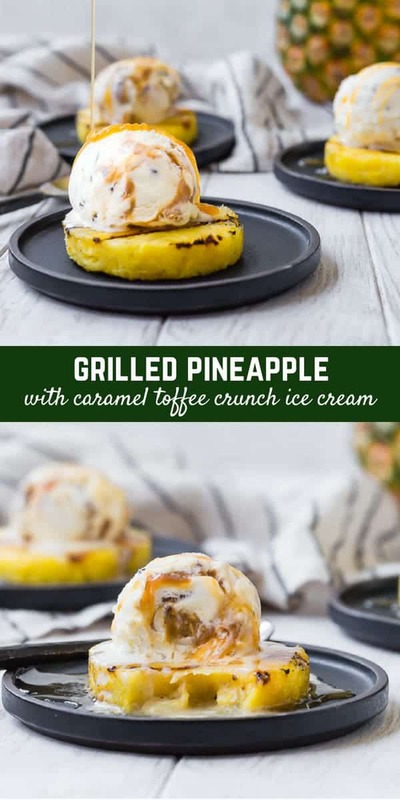 The natural sugars of the pineapple caramelize and become even sweeter when you grill it, and you’re topping the grilled pineapple with sweet, creamy ice cream. Let’s talk about that ice cream! I partnered with Tillamook to develop this recipe, and let me tell you, I’m obsessed with their ice cream now. I was first introduced to it in Detroit, and now I absolutely cannot get enough of it. If you like your ice cream ultra-creamy, rich, and smooth, this is the ice cream for you. Side note: Is there anyone out there that doesn’t like their ice cream creamy? Just wondering. Tillamook uses premium ingredients, so it’s not a surprise that the end product is a premium ice cream. Plus, they’ve been making it since 1947 so they have it mastered at this point! PS: Good news, fellow Michiganders! You can buy Tillamook Ice Cream in Michigan now! Click here to find out where you can buy it. Tillamook is a farmer-owned dairy brand based in Oregon (you might be familiar with their spectacular Cheddar! ), and this is the first time you can buy it in Michigan. It’s great news for us! This particular flavor of ice cream is called Caramel Toffee Crunch and it might just be my new favorite flavor. There are big ribbons of soft sweet caramel and so much crunch! I love some crunch in my ice cream and this flavor is loaded with it. Pecans, almonds, bits of chocolate, bits of toffee and cookies….it’s so good, you guys. And it’s absolutely perfect with the sweet, slightly smoky grilled pineapple. I drizzled these with caramel sauce to really drive that caramel flavor home. You could use a good quality store-bought caramel or you could make your own (it’s so easy – try my bourbon caramel sauce – it would be great without the bourbon too), or truthfully, this recipe is delicious without caramel too. The ice cream itself is loaded with caramel so no matter what, you’re going to love this. Offer the basics but also offer some unique items like this grilled pineapple. If you wanted to make serving a little easier, this pineapple would be great if you diced it (after grilling!) and then used it as a topping instead of a base. Other fun and unique topping ideas to try: Roasted strawberries or cherries, potato chips (love that salty sweet combo! ), espresso, pretzels, or flaky sea salt (I like Maldon). Keep some of the classic toppings for traditionalists! Homemade hot fudge is easy and is always a big hit. Whipped cream, chopped nuts, and chocolate chips are other great classic topping ideas. Tip: Scoop ice cream in advance and place scoops on a parchment paper lined baking sheet in the freezer. When you’re ready to serve, all you’ll need to do is grill the pineapple and top with the ice cream that you’ve already scooped. What’s your favorite ice cream topping? How do you celebrate National Ice Cream Month? I can’t wait to hear from you! Leave a comment or tell me on Instagram or Twitter – tag your response with #RachelCooks, #TillamookIceCream and #NationalIceCreamMonth to make sure we see it! This grilled pineapple with caramel toffee crunch ice cream is the perfect simple summer dessert. Everyone loves it, you can make it in about 10 minutes, and it cooks on the grill so you don't have to heat up the house! Heat grill to medium heat (350°F). Brush both sides of each slice of pineapple with melted coconut oil. Place on heated grill and grill for 4-5 minutes on each side or until caramelized, heated through, and grill marks appear. Serve topped with a 1/2 cup scoop of Tillamook Caramel Toffee Crunch Ice Cream and a drizzle of your favorite caramel sauce. Serve immediately. 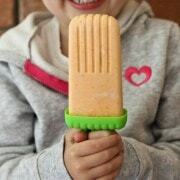 Tip: Scoop ice cream in advance and place scoops on a parchment paper lined baking sheet in the freezer. When you're ready to serve, all you'll need to do is grill the pineapple and top with the ice cream that you've already scooped. Verdict: I’ll be making this grilled pineapple dessert time and time again all summer…and maybe into fall and winter too! Husband’s take: Ben loved this – I mean, he raved about it. Couldn’t get enough! Difficulty: Easy! So super easy! 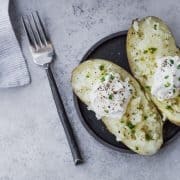 This content and recipe is in partnership with Tillamook. I was compensated for my time but all opinions are, as always, my own. Thank you for supporting Rachel Cooks by reading about brands we use and love in our own home. Sponsored posts like these help me cover some of the expenses involved with keeping this site free for you to use! Thanks Alka! I hope you try them and love them! That caramel drizzle is just tantalizing! I’m sure it’s amazing with the ice cream and pineapple! This looks SO good! I love Tillamook! Thanks! Their ice cream is amazing! What an easy summer dessert! Looks so delicious! Thank you, Alyssa! I hope you make it and love it! I LOVE pineapple with ice cream — this is such a unique way to serve it! I just love the combo of the pineapple with the ice cream. That ice cream flavor sounds so amazing!